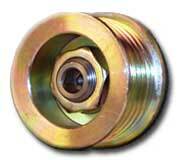 FREE OVER-DRIVE Alternator Pulley pre-installed on every high output alternator we sell! $25 Value Completely FREE! Power Bastards® is a registered trademark of Power Bastards. All other indicated registered ® trademarks are the property of the respective owners and the use hereof does not imply their approval or endorsement of Power Bastards® products. The internet's premier source for high performance automotive alternators, electrical accessories and much, much more.